[Updated] Traffic is currently being diverted at the junction of Middle Road and Tee Street in Devonshire following a two car collision at that location this afternoon [Nov 26]. A police spokesperson said, “Details are limited at this time; however apparently both vehicles were extensively damaged. “Motorists should expect delays in the area for at least the next 20 minutes until the damaged cars can be towed away. Update 5.40pm: Traffic is now flowing again. 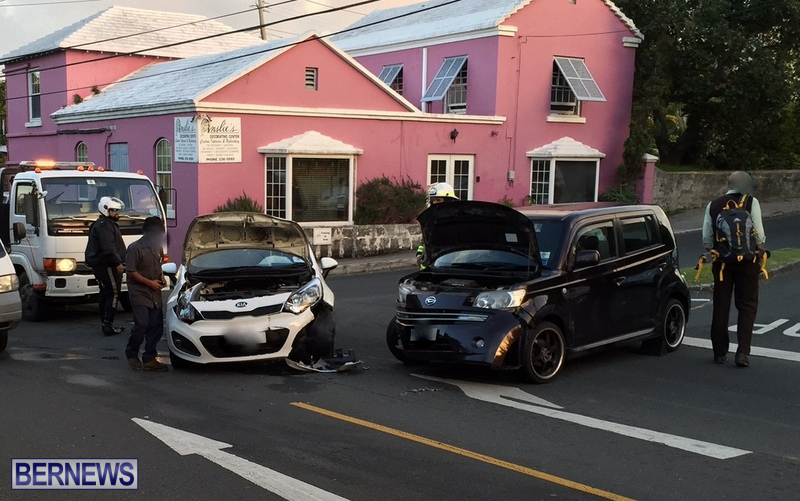 Update 6.12pm: A police spokesperson said, “Around 4:20pm on Thursday, November 26th first responders were dispatched to a reported two car damage only collision at the junction of Middle Road and Tee Street in Devonshire. “Apparently both vehicles were extensively damaged. However, there were no reported injuries. 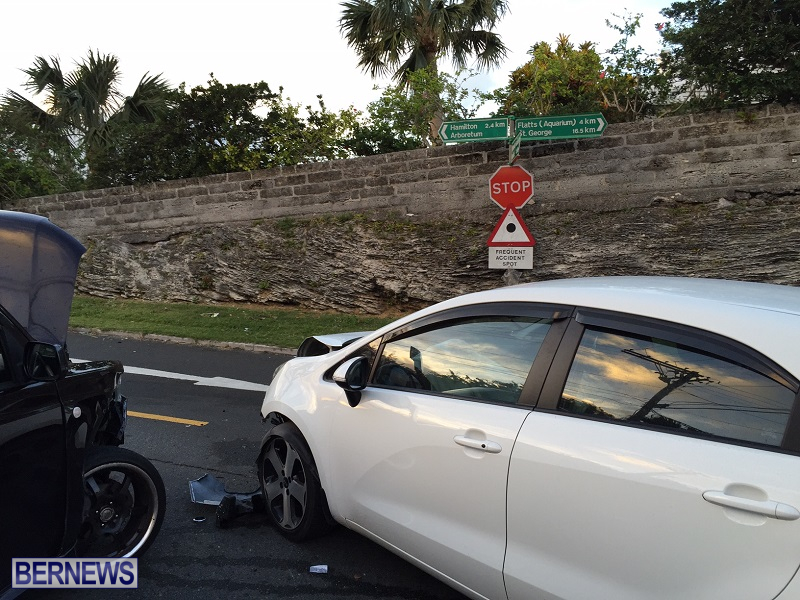 Traffic was temporarily diverted away from the area until the damaged cars were towed from the scene. Hmmmm…….took the words right out of my mouth! When are they going to put traffic lights here?!!! Such a simple solution!!! 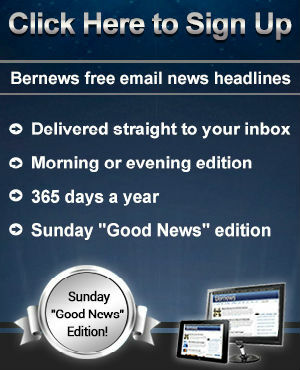 This junction is one of the most dangerous in Bermuda. It’s simply shameful. Is government waiting for a fatality there, or a GP car to get clipped, before they put traffic lights (or a roundabout)? Why does everything take so long at W&E? For pete’s sake you lot, do SOMETHING. When our MP’s drive (or get chauffeured) don’t they notice the same things we do? A mini roundabout, yes, but NOT lights. Look how well Collectors Hill lights work when they’re out of order. So if the lights are out of order then that would be just the same as it is now? Surely having lights the majority of the time is better than none at all? It was definitely a deja vu moment. Think they had the same lady speaking on the TV news about her recommendations for that intersection too. Thanks giving for no loss of life or limbs . They do not need traffic light at this junction. They need drivers to come to a complete stop. Look right, left left and look right again. If they do that then they would see any traffic coming from either direction. Um,. isn’t that what octagonal order-signs mean? The problem is not lack of traffic lights, it’s increasingly risky & bad driving habits and lack of attention. Every day I see people driving through red lights. Sometimes they stop for a few seconds first, then they proceed through the red light. Putting a light at this junction doesn’t solve the problem! Putting lights here would stop people making risky decisions because they are impatient. Sometimes you can wait there for minutes at a time with no safe way to enter the junction. @y-gurl–yes I heard the owner of Ainslies “Cindy?” speaking about it on the news after the last accident there last week.. she had some recommendations that prolly should be followed, she would know its right outside her establishment 3 successive accidents within a matter of weeks! Again, fancy wheels & high performance tires failed to compensate for driver deficiency. Clear cut due care and attention…that collision should have never happened…someone was negligent…now YOU decide. That junction has clear vision 300 yards one way and 500 yards the other…HOW do these collisions happen..? WE DON’T NEED LIGHTS…Put da phone down and pay da f#@k attention!! Hmmm…….took the words right out of my mouth! How do you know they were on a phone? Were you there or in any of the vehicles that collided? Stop ASSuming!!! Time to invest in traffic lights! As unpopular as it may sound, it maybe the only resolution to the accident issue at this particular intersection. A roundabout may make more sense than traffic lights, but in any event these incidents appear to be simple human error as opposed to some uncontrollable situation. SOME DRIVERS NEED TO FOLLOW THE RULES. I.E ITS A STOP SIGN,DRIVERS LET OTHER DRIVERS OUT OF STOP SIGNS ALLLL THE TIME.ITS A STOP SIGN,WAIT!!! ALSO, SOME DRIVERS THINK THEY CAN “BEAT”THE OTHER CAR/BIKE/TRUCK.MOST ACCIDENTS HAPPEN BECAUSE THE RULES ARE NOT ALWAYS FOLLOWED. Like everything else in OUR society the habits of driving will also continue to deteriorate as time goes marching on. Ms Laws, the owner of the pink building takes every oppurtunity to speak out … “we need lights, we need a speed bump”. When the obvious problem is the placement of her building. You simply cannot see what coming on Middle Road when coming down Tee Street. Why is that, because there a building in the way. That intersection is too busy for a building that close to the road. Government should make her move that unsightly building. W&E will get right on it. They will send a crane around next week to pick up the building & put it on the neighbours property. Blah blah, that makes not sense. There are buildings near and/or on the roads all over the island. Lights, a speed bump or a roundabout (given the space) is the obvious solution. Your “not sense” makes NO SENCE. A speed bump on Tee Street is foolish. Drivers like you are the problem. If you can’t write you probably can’t look left.